Originally from Maracaibo, Venezuela, award-winning guitarist Leonardo García has performed in North America, South America, and Europe. Spanning a full range of centuries and styles, García’s concert programs are highlighted by his rich South American repertoire. Alirio Díaz has praised García as “a faithful interpreter of [Agustín Barrios] Mangoré’s musical art,” and Eliot Fisk has described his playing as “intelligent, musical, and technically impeccable.” In addition to his solo performances, García has collaborated with other musicians—including violinist Ian Swensen and guitarist Marc Teicholz, among others—and performed the world premier of Van Stiefel’s baubles, carpets, and knives at Yale University’s first Guitar Extravaganza in 1996. 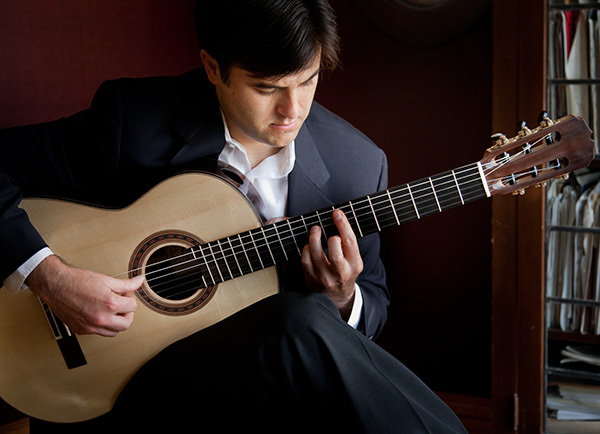 As a young student at Phillips Exeter Academy, García became the first guitarist to win both the Eli Loranger Prize for Musical Excellence and the Exeter Concerto Competition, leading to the first performance of a guitar concerto at the Academy. García went on to Yale University where he studied music, Spanish literature, and graduated with a Bachelor of Arts in economics in 1993. Afterwards, García was awarded a scholarship to study with Benjamin Verdery at the Yale School of Music where he earned a Master of Music degree in 1995 and the prestigious Artist Diploma in 1996, also becoming the first recipient of the coveted Eliot Fisk Prize. After Yale, García was invited to continue his studies with Eliot Fisk at the New England Conservatory, which he completed in 1999. In 2001 García founded KinderGuitar, a music education program dedicated entirely to educating very young children through the guitar. In 2010 KinderGuitar began adding new teachers nationwide. In addition to being an active educator and strong advocate for music education for children, García has served on the jury of the San Francisco Bay Area’s Junior Bach Auditions and has contributed essays and reviews to several leading guitar journals. When he isn’t teaching or performing, Leo enjoys cooking, running, hiking, yoga, and reading with his wife, Maya, and their sons, Max and Charlie, in Northern California.